Ancient Stones - Borders - 012 Cairn, Green Knowe, Peebles. The remains of this excavated burial cairn stand a few metres from the south east edge of the old coach road between Edinburgh and Moffat. A number of earth-fast stones around the 19.00m perimeter are all that remain of the original kerb and a cist-like structure can be seen in the south east quadrant of the cairn. 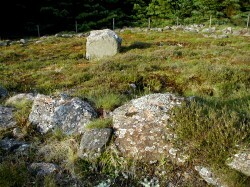 Almost in the centre of the cairn, a conspicuous large boulder measuring 1.20 x 1.20 x 0.60m can be seen, although its purpose within the structure is not clear. From Peebles take the A72 Glasgow road. After 4 miles turn right onto minor road for Eddleston. After approx. 4 miles stop in parking area at entrance to Nether Stewarton forest. Walk back along road, turn right and follow tarmac drive for Harehope farm. Turn next left along old coach road. Cairn is on left at crest of hill. None to date. However, the cairn is located within a few yards of the ancient drove road running between Lyne and Edinburgh, and would have been easily seen by travellers, as would other cairns along the same route. Perhaps there may have been some folklore association, alas long forgotten. Being situated almost on my doorstep and also in one of my favourite areas for walking, I've seen this cairn in all manner of weather conditions, from bright sunny days, cold misty dawns and even at night under a clear sky and a full moon. Always it never ceased to bring a sense of wonder. What was it originally constructed for? Who were the people to gave up their time to build it? The whole area is rich in prehistoric sites with around 20 or so cairns, forts, settlements and so on within a few square miles. It has been suggested that the large boulder is not part of the cairn but I prefer to think otherwise. You don't have stone like this within ancient burial cairn without good reason!